Pinterest may not be a social media platform that you have yet tried for your brand marketing, but it might be one that can prove beneficial. Like Instagram, Pinterest is a highly visual platform; however, the text that accompanies those visuals is equally as important—not only to appeal to your followers, but for search purposes. 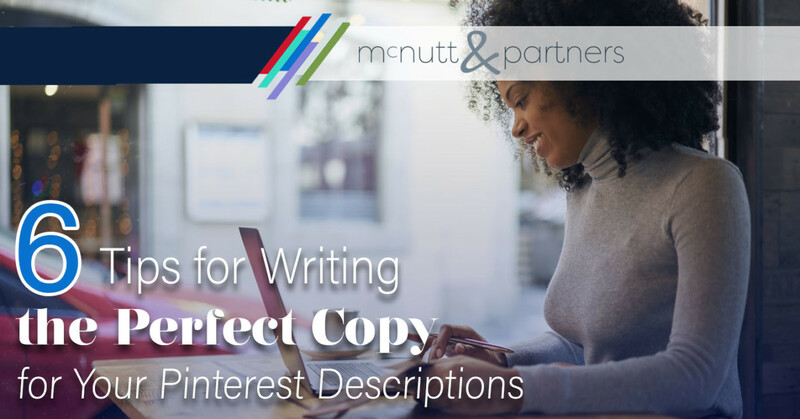 Here, we’ll give you a few tips for writing copy for your Pinterest descriptions that will help to achieve both of those goals. Wait a second, what is Pinterest? First, let’s back up. If you’re not familiar with Pinterest, think of its basic concept like a digital bulletin board or pin board. As you browse through the internet and discover different links you like, you can “pin” them to categorized Pinterest boards. Not only are they categorized for you to easily find, but they will also become visible to anyone following you on Pinterest. Vice versa, your home feed will show you what your followers are pinning as well. In addition to web links, you can also pin fresh content (graphics) that you have created, which may be more likely what you will be doing from a brand perspective. Images are the bread and butter of Pinterest, but the descriptions of those images are just as critical. A Pinterest image description is the copy that appears below the image once it is posted (pinned) to Pinterest. It is used to describe the images to users and to make your pins searchable—which is the ultimate goal. You have options when it comes to Pinterest descriptions, but some are better than others in our opinion. You can auto-fill from the website if you are posting a link, leave the description blank or create your own description. Writing your own copy for your Pinterest descriptions ensures that the information being associated with your images is accurate, appealing and optimized for search. Alright, time for the tips. Let’s look at a few ways to make the copy for your Pinterest posts stand out. Describe your image adequately. On Pinterest, some users are inclined to just use a phrase—such as the name of the product—in their copy descriptions. To have productive copy for your Pinterest posts, you should write in clear, complete sentences. Studies have shown that Pinterest descriptions with at least 300 characters generate better responses than those with fewer than 300 characters. Use this space to give users a full summary of what they are seeing. For example, going back to the baby shower example—don’t just provide the name of the product. Explain how it is useful and why it would be a good baby shower gift. Also keep in mind, however, that only the first 75 to 100 characters are what will appear in search results, so make sure the main keywords are included there. Use relevant hashtags. Hashtags are also important in having your pins show up in Pinterest search. Hashtags are clickable links that group similar hashtagged content together. When deciding which hashtags to use, think about what phrases users will be searching. Using our example from above, hashtags like “#babyshowergifts, #babyshowergiftideas #babyshower #babyshowergirl #babyshowerboy” would all apply. Avoid the use of random, inapplicable hashtags like #heylookatmycoolpost. It’s also a good idea to browse other pins in your category to see what hashtags are being used and followed elsewhere. Pinterest allows you to use up to 20 hashtags per image. Mention other Pinterest users. This is a given with any social media post, so don’t forget it for Pinterest. If you are pinning another Pinterest user’s post to your board, consider mentioning that user in your pin. The idea is, “I scratch your back, and you scratch mine.” The act of sharing and mentioning other users on Pinterest can generate a sense of camaraderie with the hope that other users will follow you and share your content in return. Include a link to your site or blog. Part of the goal of posting to social media as a brand is to get people to visit your website to learn more about you and/or purchase your products. Users can click pins and get to the associated web page (after waiting for the pin to expand and clicking again), but it can be much easier to simply provide a link in the copy for your Pinterest descriptions. That being said, make sure to only include links on images that can be found by following those links. Do not put your website, for example, on a post that links to someone else’s blog or product. This can affect credibility and ultimately cost you followers. Add a call to action. Spell out exactly what it is that you want your followers to do! Examples include “Click the link to learn more,” “Check out my blog,” “Please repin,” etc. Calls to action should be short, sweet and direct. If you’re curious about fitting into the Pinterest niche, it can’t hurt to give it a try. Use these tips for writing the perfect copy for your Pinterest descriptions to get started. Want us to manage your Pinterest page for you? We can do it! McNutt & Partners is a full-service advertising and digital marketing agency. Contact us today at 334-521-1010, or visit our contact page.